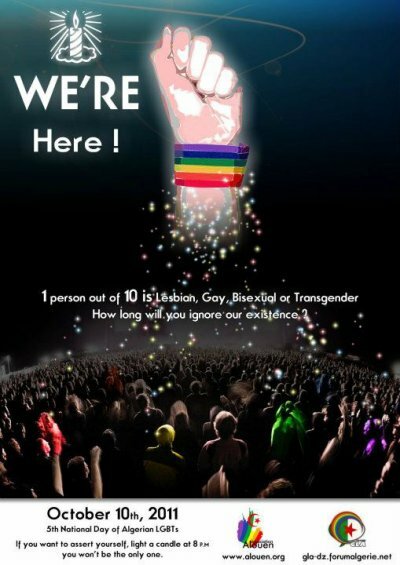 TenTen 2011 - The 5th National Day of Algerian LGBT's: It is time to accept our presence. Stop to indifference ! On Monday, October 10th, 2011 will be held, for the fifth consecutive year, the National Day of Algerian LGBT's (Lesbian, Gay, Bisexual, and Transgender). It is organized, since 2007, by a collective of LGBT activists, some of which represent a group that's been formed this year around an association project: ALOUEN. The chosen theme to celebrate this day is “Assertion”. While the Algerian society continues to deny our existence and the government insists on applying, out of the sight of the media and the international community, regressive and reactionary laws (sections 333 and 338 of the Algerian Penal Code), we Algerian gays claim proudly our existence, our membership to the LGBT community, and our strength and unity. We want the right to fight for what is right. Our determination, the legitimacy of our claims, and our will to enlighten the popular consciousness by objective and rational explanations, are the main elements in our fight. Let us commit ourselves to build a strong and solid LGBT community in Algeria whose voice agrees finally, on a common vision. A free and liberated vision. It is time to say that we are here and we are not afraid. We reject their denial and fight against their injustice. The time has come for “assertion”! A one and simple action, accessible to all, can show our strength and our unity: Each individual has in him or her, the will to affirm their support for our cause; regardless of their sexual orientation, they have to light a candle on October 10, at 08:00 PM. This gesture will be a concrete representation of our consideration as a recognized and supported community throughout the Algerian territory and over the world.